Review: Imagine this. You are a helpless little boy running his own business; he has a mom, a great aunt, a girl that's totally crazy for him, and a 1,500-pound polar bear as a work partner. What can possibly go wrong? 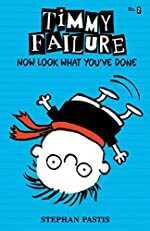 In the book Timmy Failure Now Look What You've Done by Stephan Pastis, learn exactly what it is to be a professional detective, or you might just figure out the mystery of the millennium. You might think having your own detective business is an easy thing, well trust me, it's not! Timmy has no time for shenanigans, he would much rather admire his greatness than do anything, but the point is that he has no time for that either, the Worldwide Enemy of Da Goodness In Everything (aka the wedgie) will do everything in her power to make herself sound like the best person in the world, but Timmy will not let that get in his way to becoming the greatest detective there ever was. All is peaceful, but not until the superintendent announces a multi-school best detective contest makes Timmy loose his mind. When anyone mentions anything about contests or detectives, Timmy must win. But when Timmy gets in trouble one day and cannot turn in his participation form, he is not able to win unless he goes to another school with a later due date. Timmy is now on a mission to get moved to a school for bad kids, Glouberman academy. This book is a perfect book for both girls and boys young and old. Although this book has some vocabulary that may not be understood by little children, it is still the perfect book. And do you know what's even better? There is a whole series of Timmy Failure books written by Stephan Pastis. This book is a great choice for anyone who is a mystery, comedy, or Stephan Pastis fan. This book will also help children find out how important friendship is and that in every situation you should be supported. Learn what it's like to be a true detective as you go on exciting and ironic adventures with Timmy and friends. So you probably think that you have everything down and understand all of this so well, you can just go to the store and buy this book right now, but there is just one more thing you need to know, Timmy's quote and this just might be the only three things you need to know about him; I was born, I founded an empire, I exhibit greatness, said by Timmy Failure.